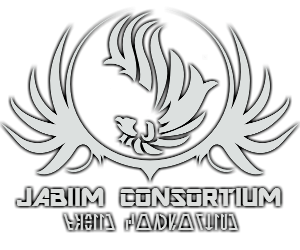 The Jabiim Consortium is a planetwide alliance of citizenry from all galactic walks of life and races. From within this nation-state an official representative is elected from within one of the four local territories to serve as their magistrate upon the five member governmental body otherwise known as The Jabiimi Council. The planetary governor holds the fifth seat on the Council and he elects a member to serve as his Regent in merchant-business affairs, while he handles the political spectrum. Headquartered on The Pearl of Phellem, the namesake planet of Jabiim. The government has collectively decided to flex some luxurious industrial muscle and offer the Jabiimite style of goods, vehicles and ships to the galaxy at large. The national motto is "Through unity we shall prevail." and they apply this attitude in their everyday lives for the greater good of all citizens on the planet. Jabiim is neutral and free of wars and political strife by design. It is a beacon for everyone to enjoy, so come to our paradise to enjoy yourself as you peruse our wares. Who knows you may wish to stay and become a citizen yourself. If it is safety you are worried about on your vacation-- no need to since we are in a truce with local pirates. Our standing militias and the Jabiimi Defense Force will keep you from harms way. For citizenship or employment requests please contact either Damyo Kruder or Sekou Tau.